For attorney Ermiza Tegal, human rights education has had a profound personal as well as a professional impact. As a young adult in 2001, Ermiza was faced with the question of what to do with her life. She had just completed her pre-university education and “I was trying to decide what I like doing, what do I feel like doing with my life and time.” Her interests were in the sciences. While waiting to be accepted into a University, she enrolled herself at human rights course to see what it was all about. She eventually started working at the organization that conducted the course as her interest in human rights had been peaked. She also became interested in studying law. 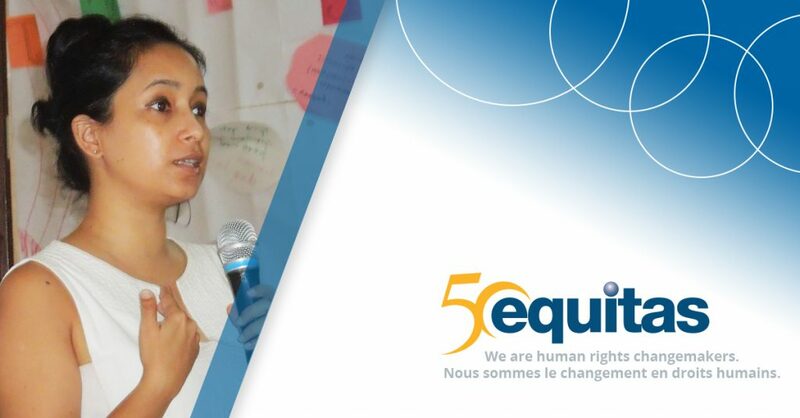 It was at this turning point that at the recommendation of a lecturer, Ermiza participated in Equitas’ International Human Rights Training Program (IHRTP), in Montreal, Canada, in 2001. “There were so many different countries represented at this program and everyone seemed to connect to it. There was this amazing unifying tactic that cut across those boundaries and even differences in language and culture.” Besides a broader world view, the program gave her something not readily found in the culture of her native country of Sri Lanka, confidence that she did have something valuable to say and that people would listen and engage with her. The other side of Ermiza’s intense focus lies with passing along the education she’s received to her clients and others. “I want to be a different kind of lawyer. I want to talk to clients and tell them what the law is. I want to explain to them how it works so they can decide for themselves. It empowers them to engage.” She also sees the potential impact of sharing human rights education on an even broader level. Whether interceding between local human rights organizations and various state agencies, sometimes also UN agencies, or accompanying a client to the local police station to lend her voice to support theirs, Ermiza strives to fill in or highlight the existing gaps towards protecting human rights. As a woman in a “man’s field” that hasn’t always been easy, but she is determined to continue this important work and educate others as she does so. Her forward focus? “I would say women and children, because there has been such a rise in numbers of abuse, violence – and it speaks to our culture and the fact that we keep denying it as a real problem in Sri Lanka. Those are issues I would put on the table saying that’s something I want to focus on. Because as much as we talk about it, there is a bigger and more powerful community that also wants to not talk about it. So there’s nothing wrong with at every opportunity putting it on the table, even if it’s in an interview.” Spend any time talking with Ermiza Tegal and one cannot help but learn something important.